Esta mascota Prole aterradora es un objeto exclusivo de la Deluxe Edicion de Warlords of Draenor, además de la mascota también incluye una montura Riendas de cuervo aterrador. Si juntas Prole aterradora y Riendas de cuervo aterrador un corazón aparece encima de Prole aterradora durante unos 3 segundos. Looks like a possible Warlords of Draenor Collector's Edition pet. Icon is the same as Reins of the Raven Lord. If it ends up looking similar to the Ji-Kun Hatchling it's going to be adoooorable! Kind of a cross between Ji-Kun and Anzu (more specifically the Dread Raven). 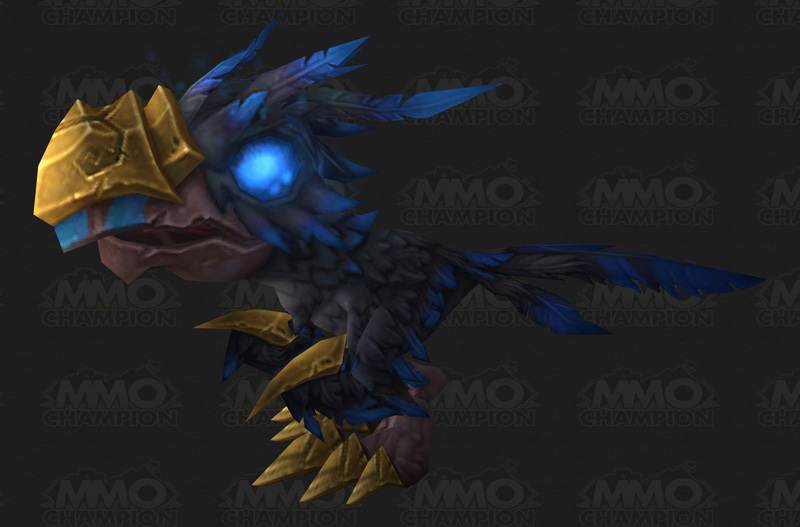 Given that the tooltip on the Dread Raven strongly suggests it will be the Collector's Edition mount, it seems very likely this will be the Collector's Edition pet, a companion to the mount like the Lucky Quilen Cub was. So it's a baby Raven Lord. Eh. Not much creativity, Blizzard. I'm noticing he de-summons if you're mounted and then try to fly. You have to re-summon him on landing. Anybody else having this issue? I usually don't have to re-summon other pets. Haz clic con el botón derecho del ratón para invocar y retirar a tu prole aterradora.